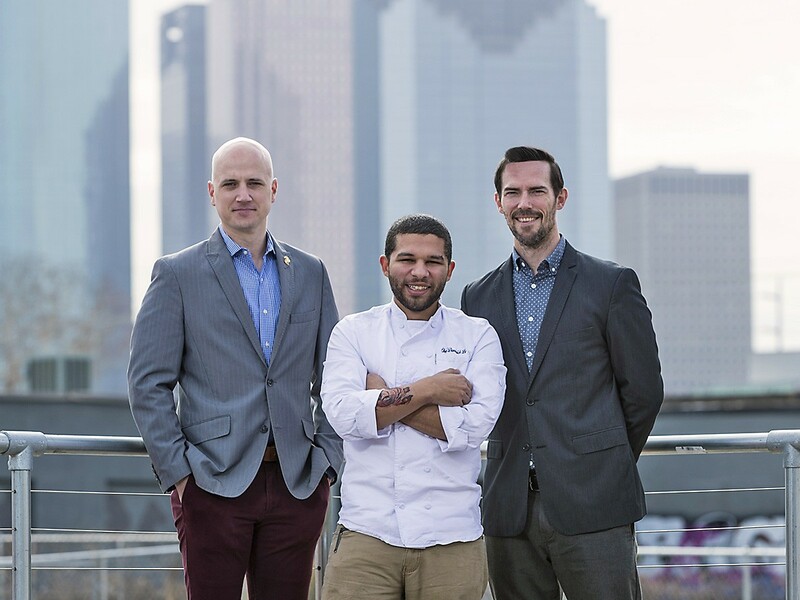 More of Poitín's leadership team from left to right: general manager Todd Leveritt, executive chef Dominick Lee and owner Ian Tucker. Photo by Trevor Gerland. Ian Tucker, an Irish native who owns the cheekily named Balls Out Burger in Houston, is overseeing construction on his second endeavor. The restaurant is named Poitín (pronounced PUUT-cheen) and it will open at 2313 Edwards as the anchor tenant at Sawyer Yards in either late spring or early summer. Tucker’s restaurant experience before opening Balls Out Burger in June 2017 is as owner of bar and restaurant group The Exchequer in Dublin, Ireland. Funding was secured for Poitín from 182 investors at crowdsourcing platform NextSeed. Poitín is named for Ireland’s strong version of moonshine. (Check out this video to get an idea of the spirit’s potency.) The restaurant has long been part of Tucker’s overall plans in Houston. Poitín, along with Balls Out Burger, were both announced back in February 2017. According to a representative, Poitín “will offer a diverse range of dishes from across the globe prepared in authentic ways.” Tucker has tapped Dominick Lee, formerly executive sous chef at Kiran’s, as executive chef. No further dish details are available as a representative says that Lee is still developing the menu. Lee is a New Orleans native who relocated to attend the Art Institute of Houston. His education there was funded in part thanks to winning a scholarship from chef-owner Chris Shepherd of One Fifth (and other forthcoming restaurants, including a revamped spin-off of Underbelly). Todd Leveritt has been announced as Poitín’s general manager. His prior work in Houston includes Scott Tycer’s long-gone Aries and Gravitas, as well as Hotel Icon and El Big Bad. Once open, Poitín’s restaurant hours are slated to be from 11 a.m. to 11 p.m. daily, with the bar staying open until 2 a.m. Thursdays through Saturdays. Brunch is planned as well, starting at 10 a.m. on both Saturdays and Sundays.